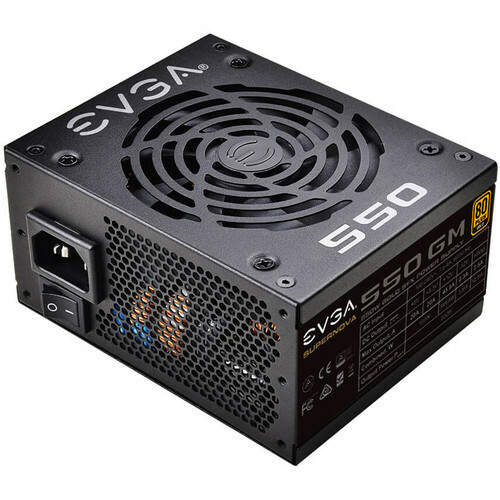 The SuperNOVA 550 GM 550W 80 Plus Gold Modular SFX Power Supply from EVGA is built for performance, durability, and efficiency. Its fully modular design lets you connect the cables you need and store the rest. With less cables, there'll be less clutter resulting in improved airflow and lower temperatures. The SuperNOVA GM is built with a single +12 V rail, Japanese-grade capacitors, and a quiet 92mm fan that delivers efficient cooling at low noise levels. It comes with a SFX to ATX bracket adapter, and features heavy-duty protections to protect your system from damage. Box Dimensions (LxWxH) 11.0 x 7.8 x 4.0"